I prefer a thinner cioppino broth so I always have extra clam or shrimp broth on hand, shrimp broth is one of my personal additions to the recipe. You can add any seafood, but keep in mind that it is not necessary to (boil) the seafood, and the cooking times of each fish varies. I always separately steam the clams or mussels until they just pop open, reserving the steaming liquid to toss into the pot after straining for sand. In a very large soup pot, heat 1/4 cup of the olive oil until shimmering. Add the chopped garlic, jalapeños, bell peppers, onion and bay leaf and cook, stirring occasionally, over moderately high heat until softened and beginning to brown, about 10 minutes. Add the tomato paste and cook, stirring, for 1 minute. Add the wine and cook until nearly evaporated, about 1 minute longer. Add the chopped tomatoes and their juices and cook over moderately high heat until slightly thickened, about 5 minutes. Add the clam broth and water, season lightly with salt and generously with pepper, and bring to a boil. Simmer over moderate heat until the broth is reduced to about 8 cups, about 20 minutes. 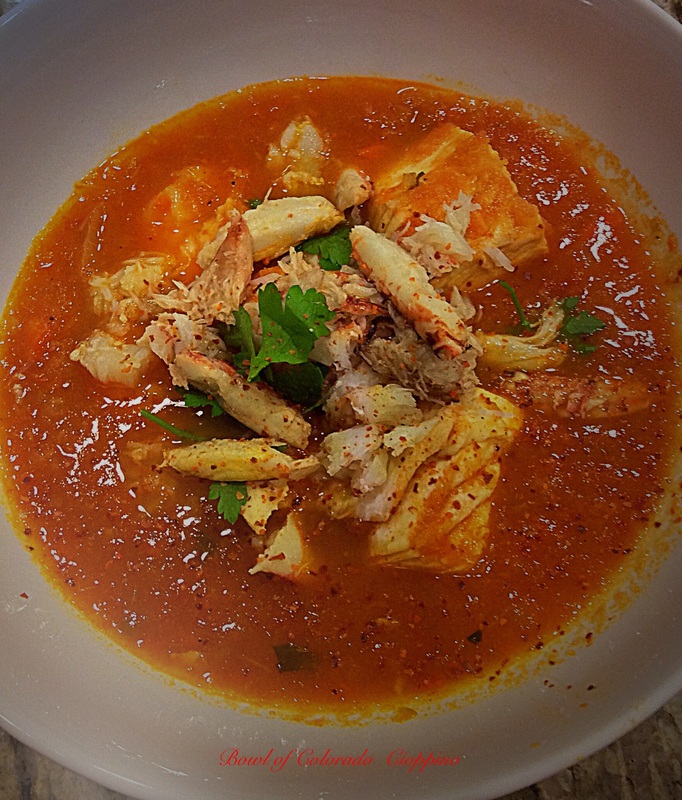 MAKE AHEAD The Dungeness crab cioppino can be prepared through Step 1 and refrigerated for up to 3 days. NOTES Have the fish monger steam the crabs for you. For this cioppino, choose a dry Barbera from Italy’s Piedmont. Its medium-bodied fresh fruitiness will taste great both in the recipe and served with it.